Nihilego in game: 1,341 Who? Important notice! Pokemon Nihilego is a fictional character of humans. Nihilego (Japanese: ????? Utsuroido) is a dual-type Rock/Poison Pokémon introduced in Generation VII. It is one of the Ultra Beasts and is known by code name UB-01 Symbiont (Japanese: UB01 Parasite). 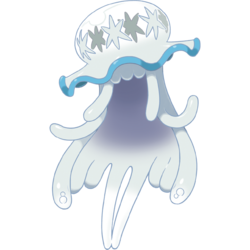 Nihilego is an Ultra Beast which resembles a jellyfish. It is mostly white and has tentacles shaped like the hair, dress, and legs of a girl. The top of its head is a bell that resembles a sun hat. The bell is transparent save for six pointed stars around the crown, and the brim has a blue edge. The ends of the "hair" fly out, resembling arms, and the outer tentacles of the "dress" have two bubbles inside. Nihilego is a parasitic organism, capable of injecting a neurotoxin that subtly alters the thoughts and actions of any human or Pokémon that becomes its host. This neurotoxin stimulates intense feelings of excitement while causing a loss of inhibitions, which acts to forcibly bring out any latent potential within the host while wearing away at their minds. At the same time, it seems to subvert its host's personality and instincts, causing the host to act in a manner that benefits Nihilego directly even when doing so involves acting against the host's own interests. Nihilego's exact levels of intelligence are unknown, but according to the Aether Foundation's research it seems to act mainly on a self-preservation instinct. It has been observed behaving like a young girl, though the exact reasons for why it does so are unknown. 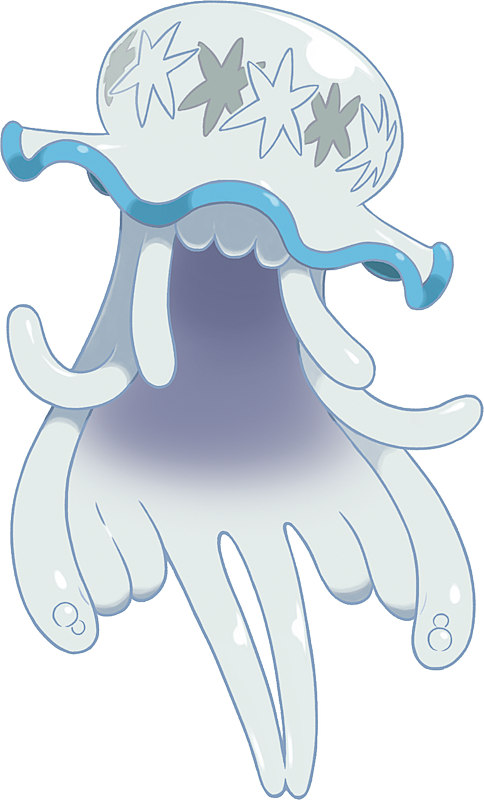 As shown with Lusamine, Nihilego is capable of physically possessing its hosts in addition to manipulating their minds. In this "merged" state, the bell loses its stars, developing several iridescent spots across its surface; the host's body is visible within the bell, with their legs dangling beneath it. Its eight tentacles become long and flattened in appearance, and what appear to be eyeballs with colored diamond-shaped "pupils" cover their surface, along with smaller multi-colored dots. Four of the tentacles are connected to the "hat" via frilly white structures; these tentacles have four spines protruding from them that can be used similarly to hands. The remaining four tentacles each terminate in a single smaller spine. While this merger can be disrupted, the lingering toxins and the shock of the separation are likely to leave the host in critical condition, both physically and psychologically. No other Pokémon has the same type combination as Nihilego. It is the only Ultra Beast to have a unique type combination. Nihilego is the only genderless Poison-type Pokémon. 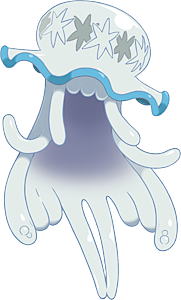 Nihilego may be inspired by a jellyfish, especially Aurelia aurita. It may also draw inspiration from Myxozoa, a class of microscopic Cnidarian parasites, particularly the Myxobolus cerebralis that are known to infect "whirling disease" in various fish species. The disease causes the fish to develop bone and neurological abnormalities that cause them to swim in a corkscrew-like "whirling" motion. Nihilego may be a combination of nihil (Latin for indefinite nothing) and ego (Latin for I), which together roughly translates to "I am nothing" or "I have nothing"; or ego. In either case, it serves as a reflection of Nihilego's ability to enslave its hosts. Utsuroido may be a combination of ?? utsuro (void), void, and id. It also might refer to ? utsu (depression), ??? utsuroi (the act of moving from host to host), and android or the suffix -oid (meaning "of similar form").